MANILA, Philippines - Some local government units (LGUs) in Luzon announced class suspension for tomorrow, Monday, August 1, 2016 due to inclement weather brought by Severe Tropical Storm Carina. Cagayan Governor Manuel Mamba declared on Sunday the suspension of classes in all levels in Northern Cagayan and in pre-school for the rest of the province effective Monday. According to state weather bureau PAGASA, 'Bagyong Carina' has made landfall over Cabutunan point past 2 p.m. today and is now traversing northern Cagayan. At 1:00 p.m. Sunday, the center of 'Carina' was estimated based on all available data at 70 km East of Tuguegarao City, Cagayan (17.9°N, 122.3°E). Tropical cyclone warning signal (TCWS) no. 2 is hoisted over the areas of Isabela, Ilocos Norte, Ilocos Sur, Apayao, Mt. Province, Ifugao, Kalinga, Abra and Cagayan including Babuyan Group of Islands. Meanwhile, TCWS No. 1 is up in Batanes Group of Islands, Benguet, La Union, Nueva Vizcaya, Quirino, Pangasinan, Nueva Ecija and Aurora. Based on Executive Order No. 66, s. 2012, when Signal No. 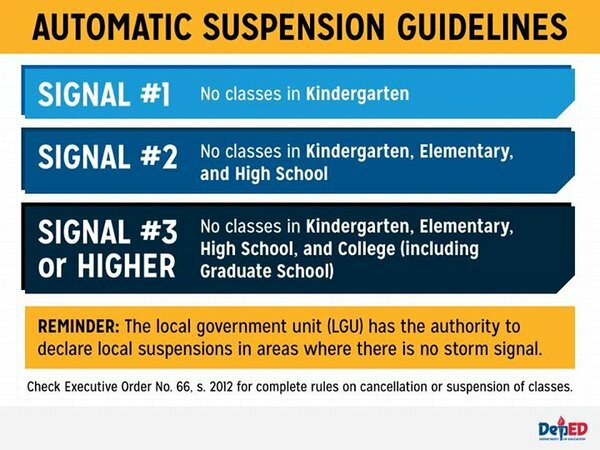 1 is raised by PAGASA, classes at the pre-school level, in the affected area, shall be automatically cancelled or suspended. For Signal No. 2, there should be no classes in kindergarten, elementary and high school.